Citation Information: J Clin Invest. 2017;127(9):3300-3312. https://doi.org/10.1172/JCI86881. M2 macrophages, innate lymphoid type 2 cells (ILC2s), eosinophils, Tregs, and invariant NK T cells (iNKT cells) all help to control adipose tissue inflammation, while M1 macrophages, TNF, and other inflammatory cytokines drive inflammation and insulin resistance in obesity. Stromal cells regulate leukocyte responses in lymph nodes, but the role of stromal cells in adipose tissue inflammation is unknown. PDGFRα+ stromal cells are major producers of IL-33 in adipose tissue. Here, we show that mesenchymal cadherin-11 modulates stromal fibroblast function. Cadherin-11–deficient mice displayed increased stromal production of IL-33, with concomitant enhancements in ILC2s and M2 macrophages that helped control adipose tissue inflammation. Higher expression levels of IL-33 in cadherin-11–deficient mice mediated ILC2 activation, resulting in higher IL-13 expression levels and M2 macrophage expansion in adipose tissue. Consistent with reduced adipose tissue inflammation, cadherin-11–deficient mice were protected from obesity-induced glucose intolerance and adipose tissue fibrosis. Importantly, anti–cadherin-11 mAb blockade similarly improved inflammation and glycemic control in obese WT mice. These results suggest that stromal fibroblasts expressing cadherin-11 regulate adipose tissue inflammation and thus highlight cadherin-11 as a potential therapeutic target for the management of obesity. 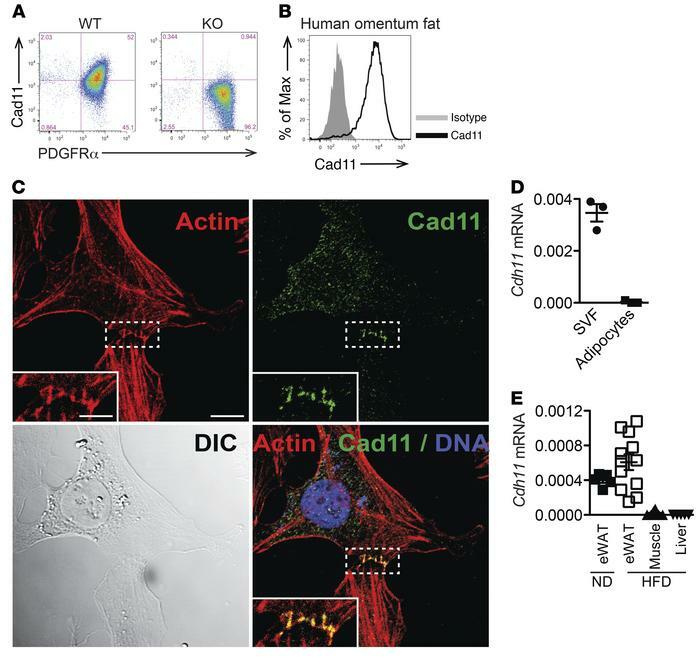 Cadherin-11 is expressed by fibroblasts in adipose tissue. (A) Representative flow cytometric plots of cell-surface cadherin-11 (Cad11) expression on CD45–Ter119–CD31–PDGFR+ fibroblasts among SVF cells in eWAT from WT and cad-11–/– mice. (B) Cell-surface cadherin-11 expression on CD45–CD235α–CD31– cells in stromal vascular cells isolated from obese human omentum fat (data from 1 of 3 experiments with similar results are shown). Max, maximum. (C) Confocal microscopic images of cadherin-11 expression (green) at adherens junctions on day-2 ex vivo SVF cell cultures. Cells were costained with phalloidin (actin, red) and DRAQ5 (nucleus, blue). Scale bars: 10 μm and 5 μm (insets). DIC, differential interference contrast. (D) Cdh11 mRNA relative to GAPDH in SVF cells and adipocytes from adipose tissue of WT mice (n = 3) fed a HFD for 5 weeks. (E) Cadherin-11 expression in eWAT, muscle, and liver from WT mice fed a ND or HFD for 5 weeks (n = 5 ND-eWAT, n = 12 HFD-eWAT, n = 10 HFD-muscle, and n = 5 HFD-liver; data are combined from 3 independent experiments).